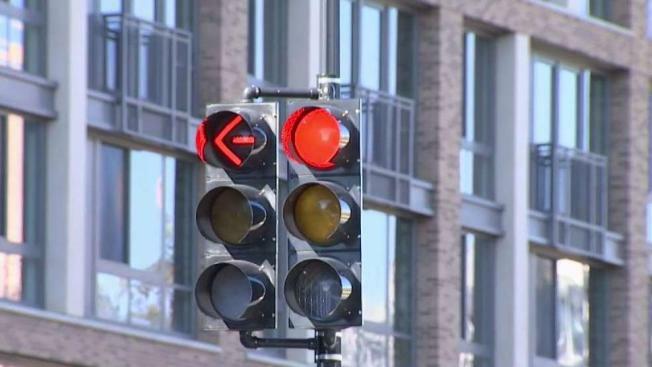 D.C. officials are considering banning right turns on red in some parts of the city as a way to increase street safety, News4 has learned. "No Right Turn on Red" could be the law of the land in the downtown Central Business District and be expanded to include school zones and high-accident intersections, according to those familiar with the plan. "It is among the fresh ideas being considered" as part of a larger Vision Zero plan, which aims to eliminate all traffic-related deaths and injuries by 2024, an administration official with direct knowledge of the proposal said. When asked about the proposal, D.C. Department of Transportation Director (DDOT) Jeff Marootian said, "We’ll be making some announcements along those lines about some plans that we have to modify those operations. There are a number of things [we can do] — everything from the way we organize our traffic signals to things like right and left turn movements." Speed limit modifications are expected to be addressed in an upcoming announcement by D.C. Mayor Muriel Bowser. D.C. has seen a rash of pedestrian and cycling deaths in recent weeks, and traffic fatalities are up overall. According to DDOT statistics, three cyclists have been killed on city streets this year, and 11 pedestrians have died, including one man on a scooter. Overall, there were 29 traffic fatalities in D.C. as of Oct. 19. Cycling advocates immediately cheered the possibility of new "Right Turn on Red" rules. "I think that the mayor has finally heard the calls from the public that we are at a crisis for traffic safety," said Greg Billing, head of the Washington Area Bicyclist Association. He said the city has seen a 19 percent increase in traffic fatalities this year so far, compared to the same period last year. "Right turn on red was never really about safety," Billing said. "It came about in the '70s to save gas during our oil crisis. It was proposed to say, 'Why am I sitting at the light waiting, when I can turn right and it’s free?' And there was never any data to say that it saved gas. So now it’s coming back and saying, 'Was that policy really good for traffic safety?' And we think no." Some D.C.-area drivers have a different opinion. "I’d hate to lose a right turn on red anywhere," driver Tony Atkinson said. "I would imagine somebody with bigger brains than me did some math and they think it is going to help, but who knows. I imagine it will make a lot of people upset." Bowser is expected to discuss the proposal Tuesday at a meeting with D.C. Council members.